Well everything art-wise for the last two months has been all about the group show I’m a part of in a few weeks time (see posts below). I’m currently half way through my last woodcut for the show and what better time but to create a great big distraction. 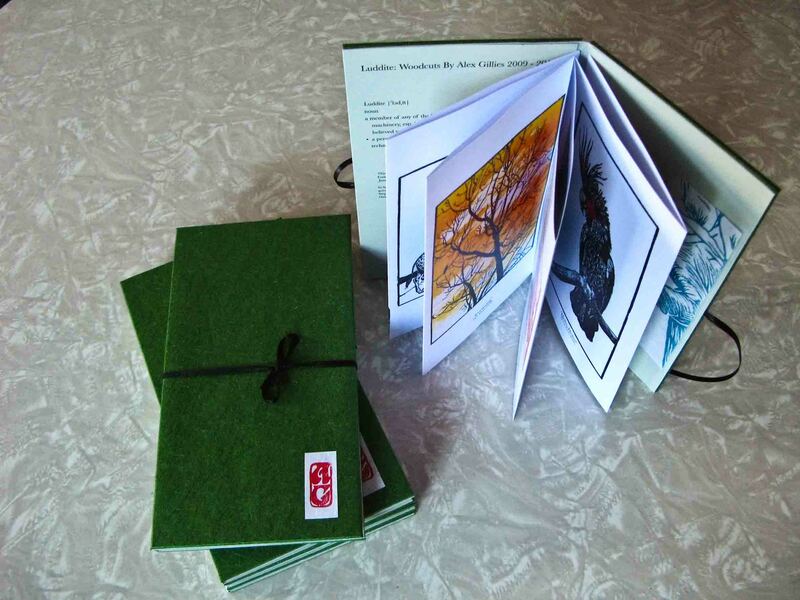 One in the form of another handmade book so I can show off some of the work I did last year. I would almost say that this is becoming an annual thing for me, if it wasn’t for the fact that we’re only three weeks into 2012. In 2009 I made my first hand-bound artist book. I only made 5 copies of it though. In 2010 I made a much smaller sized one and there ended up being 31 copies over two editions of that made (with nine copies still somewhere amongst my books and records). In the middle of last year I made a deluxe book but seeing as it took ages to put together and wasn’t cheap to make, I only made seven copies, I couldn’t work out what I should do with them so I ended up giving them away to people who had bought some of my artworks. I love making artist books, they are not only challenging to plan, construct and make but it’s nice to look back over what you’ve done recently and it does give you a sense of accomplishment. I always try to do something different each time with the bookbinding side of things and the one I’ve made this time could almost be considered a back to basics artist book. 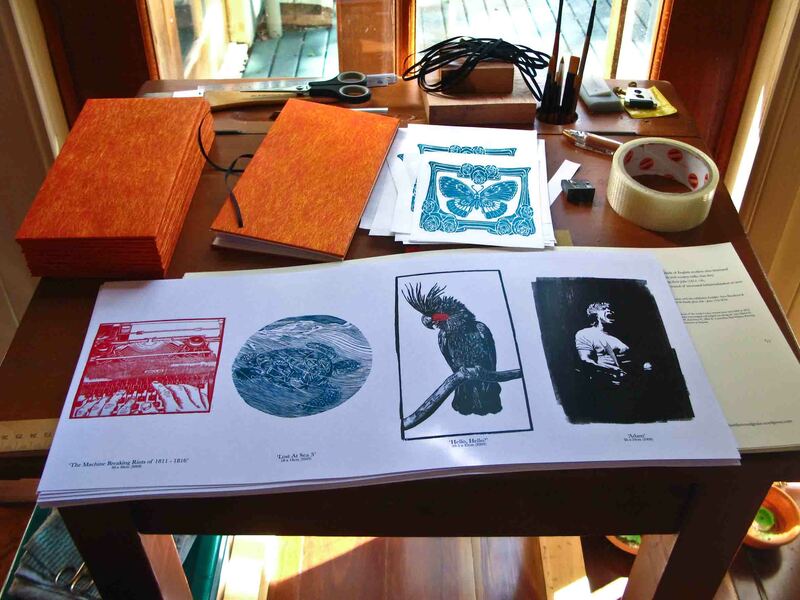 It’s a 16 page double-sided concertina layout with full colour reproductions of some of my favourite woodcuts that I made last year (well Dec 2010 to Jan 2012 to be precise). Also included in the book is an original hand-coloured woodcut that I’ve done exclusively to go with this book. The original plan was to make a book that I could have to sell at the Wasted Dream art show in February but as everything came together last week I (again) didn’t know how many copies to make. So this time around I’m trying something a little different. Rather than making something and hoping others are interested (because I’ve already got my copy to keep so I’m happy) – I’m going to only make copies of the book for people who really do want one or for folks who are interested in the art I make but maybe don’t want to spend lots of money on a big print. So I’ve set up a page where you can go and look at the book a bit closer and buy it through paypal. It’s $35.00 (Aus) and there are postage or pick up options available. Here’s the catch though… The book will be available to purchase for one month (24th Jan – 23rd Feb). After that I won’t be making any more. I’ll make the books over the next few weeks and at the end I will edition them accordingly and either post them out or (if you’re in Brisbane) bring them to the Wasted Dream art show. That means that there might only be three books made or maybe 30? 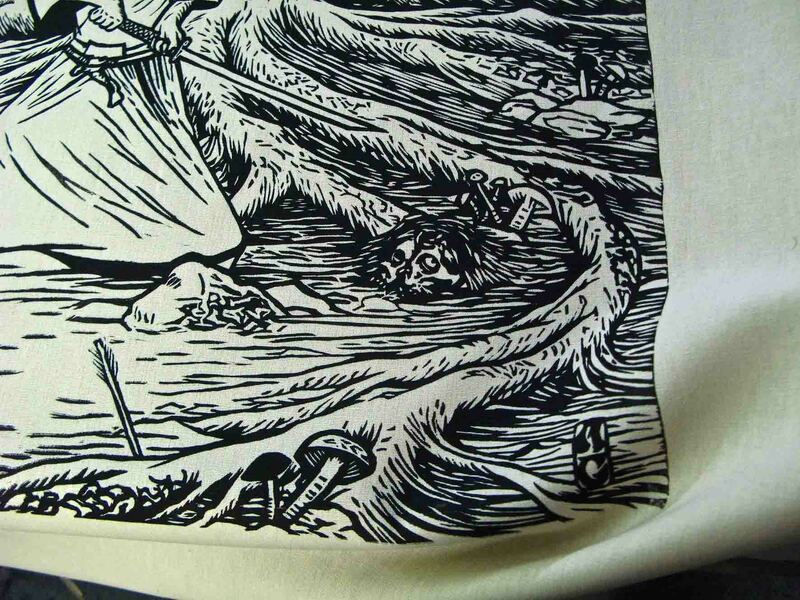 I don’t know yet but this way no one misses out and I get to move onto more woodcuts (insert a short attention span). A little update because things have been quiet round here. 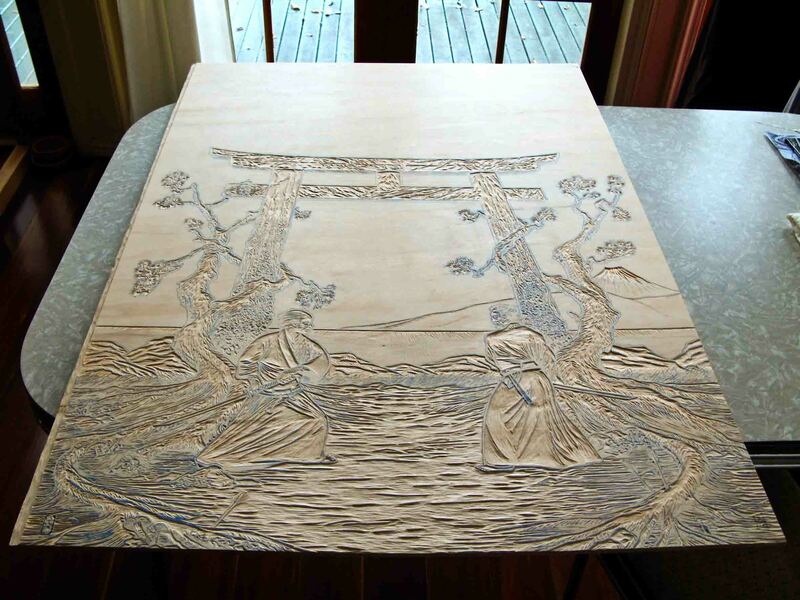 I’m still working on the triptych of woodcuts that I started back at the beginning of June. In fact I’m only half way through this project. I hope to have them finished by the end of the year, so things are probably going to stay quiet for a while yet. Recently though I went and did some test prints of the first completed part of the triptych. This was both scary and fun. Thankfully I had my friend Jaceck (and his press) to make sure it all worked. In other news, a while ago I mentioned that the handmade books I’ve made were available from the Brisbane Gallery Of Modern Art. The other day when I was there I decided to take a photo of my books on display. It was great to hear that they only have four copies currently left in stock. …and this is the limited original print that comes with each copy of the book and will not be available elsewhere. The fine folk at Nine Lives Gallery asked me to contribute to their mobile gallery that they are hosting at the Splendour In The Grass festival. I’ve contributed three pieces and while I will not be there in person, It’s nice to know plenty of gumboot wearing people will get to see some fine art amongst the myriad of things happening up there. If I get my hands on some photos I’ll throw them up here. There’s a good and a bad side to making limited numbers of your art. 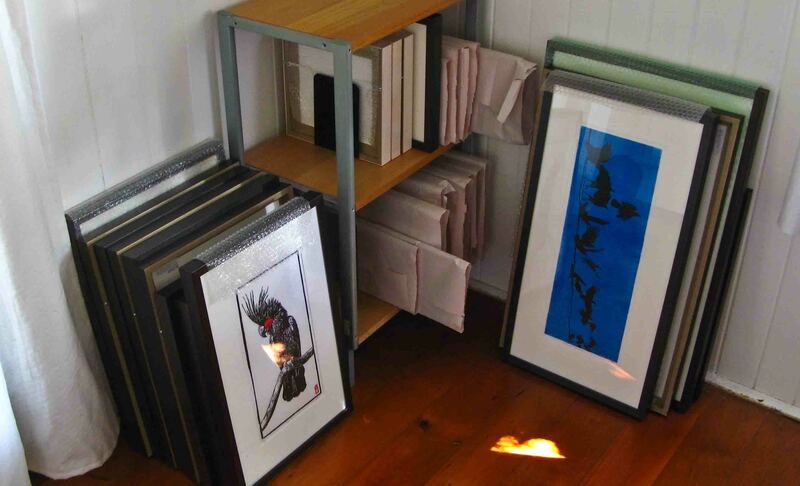 The good is that you don’t often have to find storage space at home for all your creations. The bad side is that your friends and others miss out if they’re not quick enough. 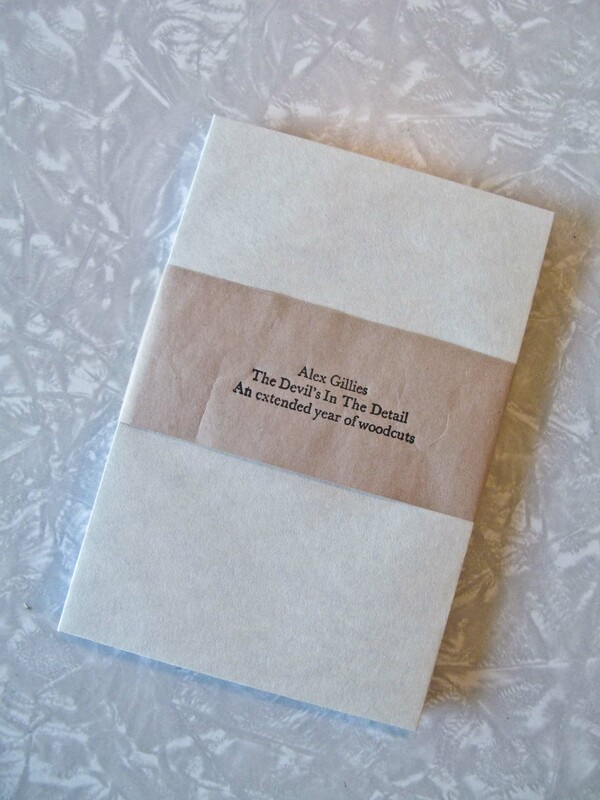 This was the case with a series of souvenir handmade books I made for my Doggett St Studio art show. 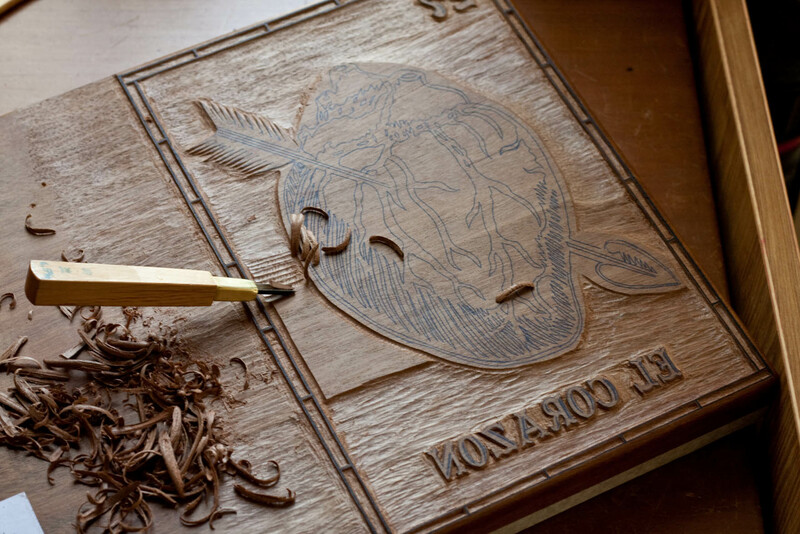 The books showcased most of the woodcuts in the show (and one or two not in the show) in a nice little hardcover concertina styled creation. The book was an edition of 11 and was all sold out in around an hour on opening night. Still you can check them out here. 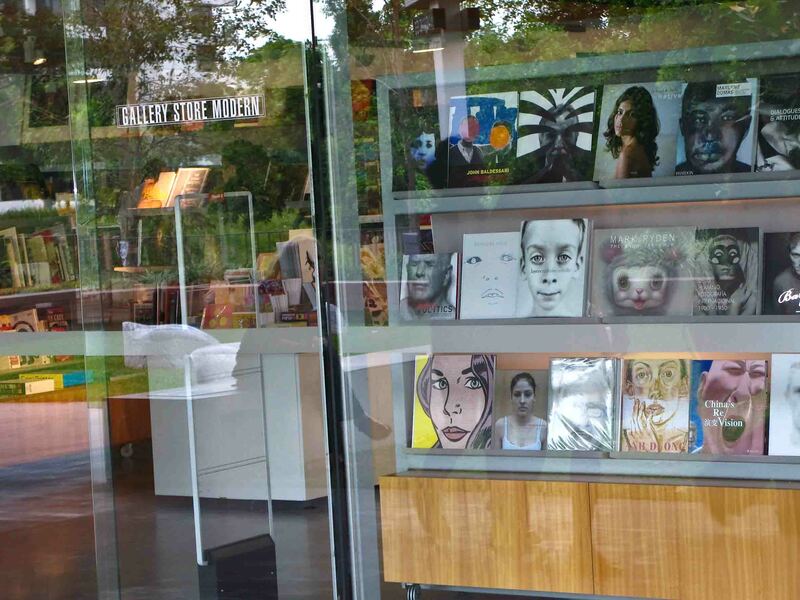 So fast forward to a couple of weeks ago and while I was at GOMA buying some great woodcuts from North Korea (more on that below) the bookstore manager Peter asked me if I would put some of my books in the GOMA store to sell. What an awesome opportunity! And so I’ve made a second edition of books. This time I’ve made 20 copies and have made some changes. 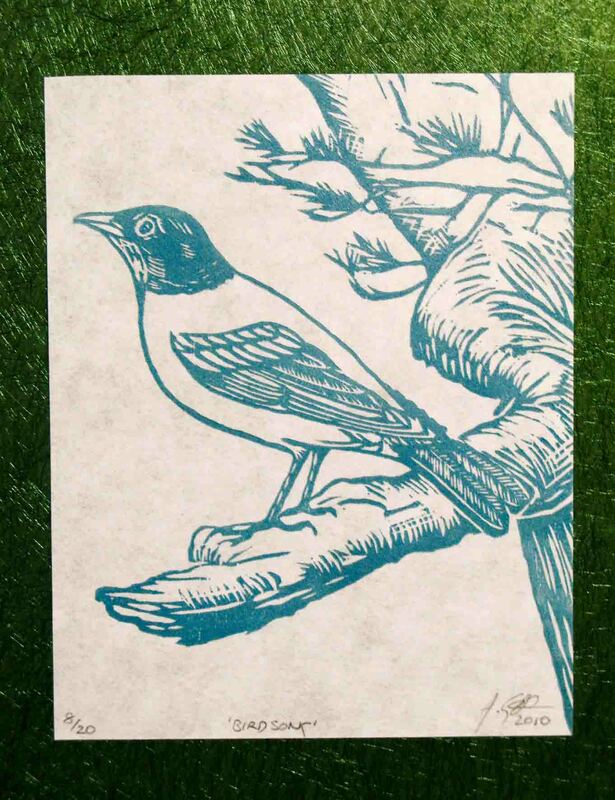 This edition is green and like the first edition, has an original, unique woodcut print in the back of the book only this edition has a different print which will be available nowhere else. …and the last bit of exciting woodcut related news I have (and mentioned above) is in regards to some art that I’ve purchased recently. 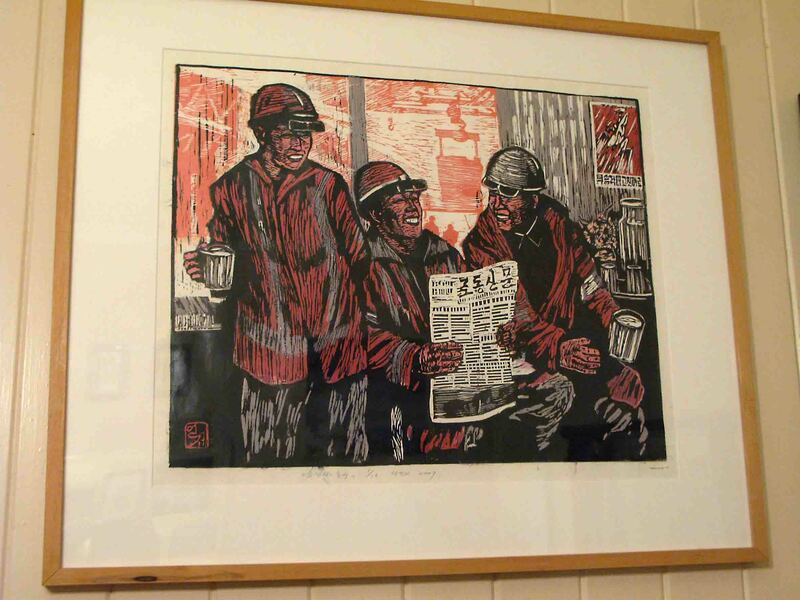 A few months ago the state gallery had it’s triennial of art from the Asia Pacific region and amongst it all was a room full of wood and linocuts from The Mansudae Art Studio in North Korea. 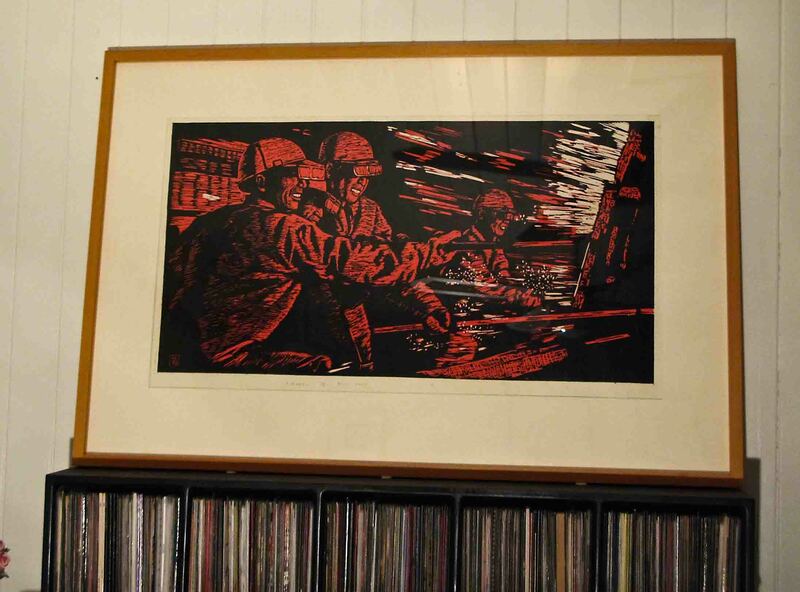 I spent a lot of time looking at these full colour relief prints and putting the politics of North Korea aside, I believed that these are great art. 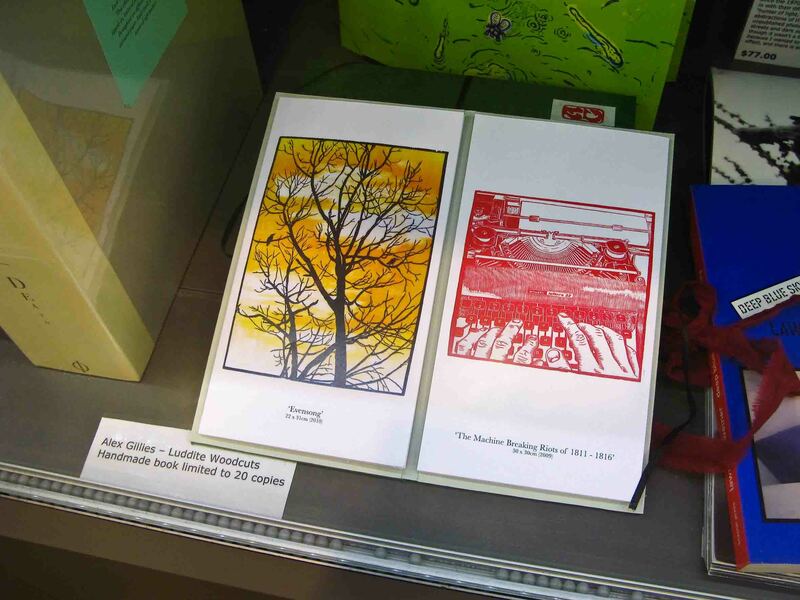 A few weeks after the exhibition closed, I went into the galleries bookstore and saw four of the prints in the show on sale. I could only afford two of them but I was so chuffed to have them to look at daily and be inspired by. The biggest of the two though is a meter and a half long and is so heavy that I couldn’t put it up on my wall. Instead it sits atop my shelves of records. The smaller one however currently sits pride of place in the loungeroom. With these two pieces coming into my home, I got all inspired to frame up another print I got earlier in the year of a local artist named Sue Pickford. 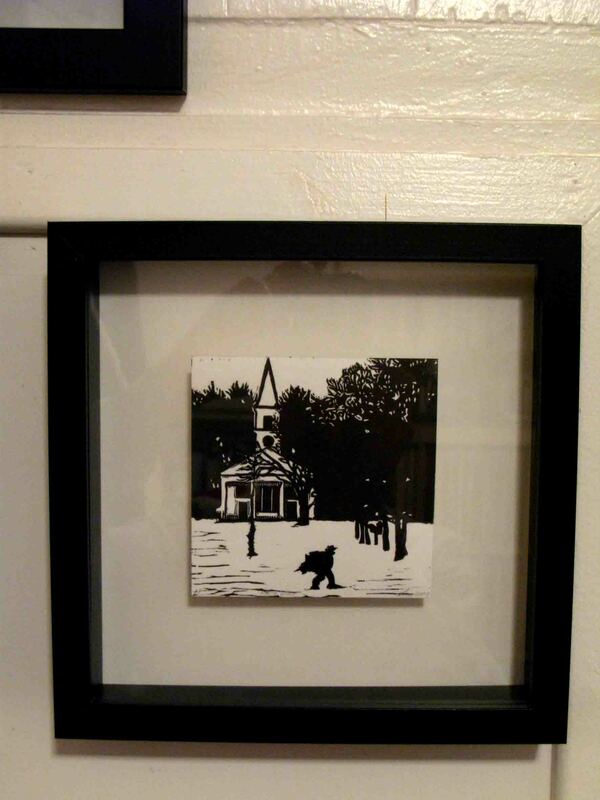 This is her linocut and it currently hangs on my “art wall” in my music room. I have more art currently at the framers and so I’ll tell you more about those when I get them back home. Now I’m going to turn my attention towards the second panel of my collaboration so I guess I’ll be quiet for quite a few weeks to come. As soon as invites and details are finalised in the next few days I will put them up here and let you know. It’s exciting, I’ve just realised that I have around 20 new pieces both big and tiny. So keep the 4th June, 6-8pm free and stay tuned. This clip is sooooo great. Apart from the printing, letterpress, hand binding, papermaking etc… It also has one of my favourite bands (Ratatat) as the soundtrack. Best thing I’ve seen on the internet in ages. I want to make another book now! If feels like the art show that gave birth to this blog has been in the making for so long. Well it kind of has. The idea was born back in February of which only half the items in the show were made. But I’m really looking forward to all my friends (and a few strangers) seeing what I’ve done. I’m equal parts elated and scared at the prospect of putting myself on display (without a drumkit to hide behind). In between those two, I’ve got 33 other pieces on show, some of them littered throughout this blog. I handmade 5 books documenting 12 months of what I’ve done (again, two of them are already sold), a 7 inch cover, four skateboards and all manner of things. 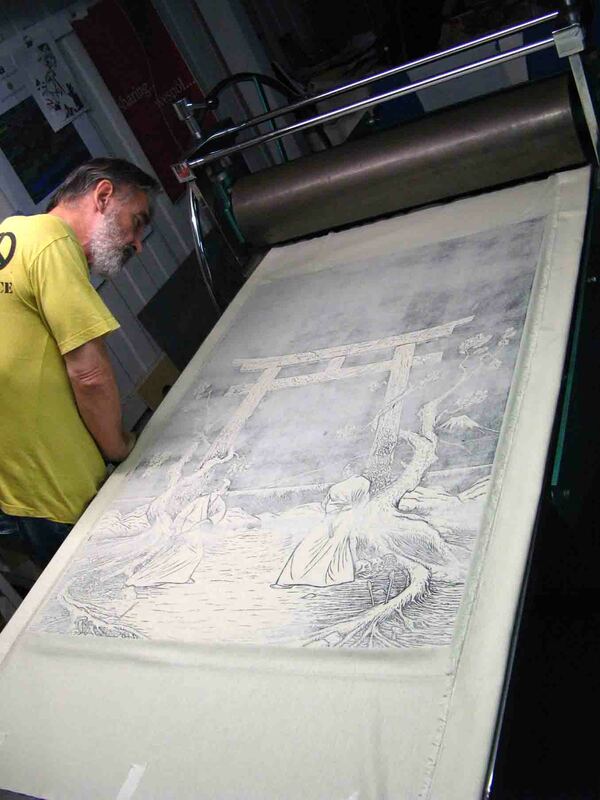 If I haven’t already told you, it’s mainly going to be the woodblocks I have on show – a bit of a faupar seeing it’s traditionally meant to be about the print, but hey, it’s my party, I’ll do as I please! There will be about 7 or 8 prints on show but all bar 2 are in editions of 1 or 2. So to the folks who have asked if I’ll have plenty of print editions availabe, the answer is no. The Nine Lives crew have informed me that the gallery will be open from lunchtime Friday 17th with the launch part starting at 6pm. The gallery will be open both Saturday and Sunday but the show is only around for three days. Once the show is over I will most likely put pics of everything up here but to be honest, they look so much better in real life. It’s cool when you can run your fingers over the blocks and feel all the detail.